What Else can I Expect from an Online Doctorate in Reading & Literacy Program? 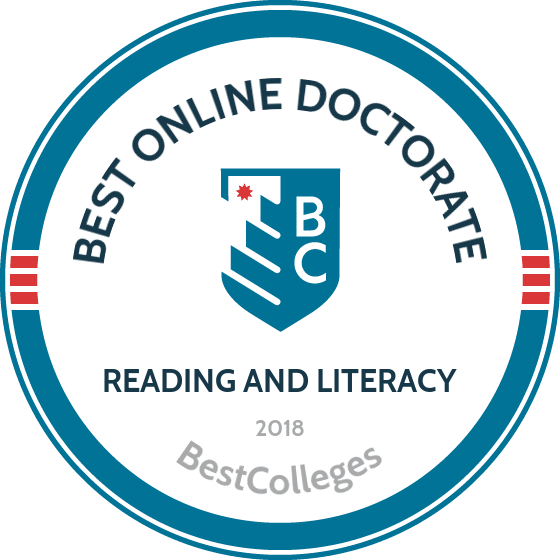 The online doctorate in literary education is a broadly applicable degree that provides the leadership skills necessary for secondary or postsecondary administration and research skills for leading faculty at any educational level. The Bureau of Labor Statistics (BLS) projects that careers related to this degree will grow between 6% to more than 10% by 2024. With the advent of social media and digital literacies, methods of teaching reading and writing need to evolve to best serve students. To meet this need, many PhD programs are incorporating courses that cover the new literacies and multiliteracies of the 21st century. The following information will help you choose the right literacy doctorate program. While previous work experience is not always required, the best reading doctorate programs generally require documentation of prior professional work. Students should have at least two years of teaching or administrative experience in a K-12 setting. Even if the school you apply to doesn't require teaching experience, remember that working in an educational role will help you apply abstract classroom theories in a practical capacity. HOW DO I FIND THE RIGHT ONLINE PROGRAM FOR ME? It's important to ask yourself what you need from a program. If you need more practical experience in an educational setting, look for programs that provide internship, practicum, or clinical learning opportunities. If you're busy with other obligations, such as work or family life, a part-time program offering asynchronous classes or generous transfer policies will make it easy to balance your schedule. Make sure you take needs like these into account when researching different programs. CAN I WORK WHILE I COMPLETE MY ONLINE DOCTORATE IN READING AND LITERACY? Many schools design and market their programs for working professionals, and online learning is often the best academic format if you can't take off time from work. Most online doctorate in literacy education programs deliver courses in an asynchronous format, allowing you to complete assignments when it's convenient. WHAT ARE THE ADVANTAGES TO EARNING MY DOCTORATE ONLINE? In addition to offering you the flexibility to complete an advanced degree while balancing a busy schedule, earning your doctorate online helps you advance in your field and earn a competitive salary. With a PhD or EdD, you can work as a school administrator, a college professor, a multisensory instructor, or even a literacy coach or supervisor. In positions like these, you can expect to earn between $60,000 and $90,000 per year. Concordia offers a PhD in leadership program with eight specializations that was founded in 2012, making it one of the newest reading doctorate programs in the country. The doctor of education/doctor of philosophy in reading, language, and literacy emphasizes classroom leadership with a specialization in reading instruction. The 61- to 67-credit online doctorate in literacy education covers the latest research in the field and offers asynchronous classes on topics such as new literacies/multiliteracies in education and cultural and socioeconomic perspectives of literature and literacy. Students can complete either an EdD or a PhD track and complete internships in clinical literacy instruction experiences. Both tracks involve qualitative and quantitative research, as well as a comprehensive exam and dissertation. Applicants must have a master's degree with a minimum GPA of 3.0, at least two years of teaching or professional experience, and submit a scholarly writing sample of at least five pages to be considered. CUC is accredited by the Higher Learning Commission. IU offers a doctor of education in literacy, culture, and language education as a cohort program that emphasizes collaboration between working professionals. This 60-credit literacy doctorate program covers research in a variety of literacy cultures, including children's and young adult literature, trans-literacy, and world languages. Online students can participate in one of several one- to four-credit internship experiences. Distance learners can complete the program in three years and must participate in at least one conference hosted by the Literacy, Culture, and Language Department. Students can transfer up to 18 credits toward the literacy doctorate program. Applicants must have a bachelor's degree with a minimum GPA of 2.75 and a graduate degree with a GPA of at least 3.5 to be considered. Those with a GPA of at least 3.0 can waive the GRE requirement. IU is accredited by the Higher Learning Commission. SJU is one of the country’s most diverse universities and boasts campuses across New York and in Paris and Rome. The school employs renowned faculty, many of whom are included on The Princeton Review’s “Best 300 Professors” ranking. SJU offers four online master’s business degrees and one doctorate in literacy. The doctor of philosophy in literacy prepares students to help at-risk populations improve their literacy skills. This 42-credit online doctorate in literacy education offers concentrations in special education, educational leadership, and teaching English to speakers of other languages. Each concentration examines the concept of literacy leadership in different educational contexts and include specific seminars covers topics like literacy for diverse populations. This program can be completed in less than three years and concludes with an intensive dissertation research project. Applicants must have a master's degree with a minimum GPA of 3.2 to be considered. SJU is accredited by the Middle States Commission on Higher Education. A literacy doctorate is a research-intensive degree that prepares students to become leading language faculty and develop literacy curriculum for multiple educational settings. Most programs are focused on addressing the needs of underserved populations. Since these skills are suitable for many careers, the coursework might change depending on the focus of each program and the concentrations they offer. The following guide can help you find the program that fits your goals and career interests. Literacy for Diverse Populations: This class covers and explores literacy issues that are unique to diverse populations. Coursework emphasizes the ways poverty and systematic inequality affect the literacy rates of at-risk communities. Depending on each school's curriculum, students will learn skills suitable for future careers as school administrators or school social workers. Issues in Literary Research: Students will investigate the cultural, social, linguistic, and historical foundations affecting major reading and literacy trends. This class prepares students for an online doctorate in literacy education program, covering the latest empirical studies in the discipline and vital research methods. These skills prepare students for research-centric roles, such as college teaching. Leadership and Decision Making: This course develops the leadership skills necessary to work as a school district administrator or classroom teacher. Students study ethics, evidenced-based learning, and leadership values to become effective educational leaders at multiple levels. Sometimes, schools include a clinical or practicum experience in an educational setting. Internship: Reading PhD programs require students to complete field or internship experiences. These opportunities allow students to hone the practical application of theory by working in an educational setting. These experiences might involve working in classroom settings, or they might focus on meeting the literacy needs of multicultural communities. HOW LONG DOES IT TAKE TO GET AN ONLINE DOCTORATE IN READING AND LITERACY? Literacy doctorate degrees can vary in length, requiring anywhere between 40 and 70 credit hours. In general, you can expect to finish your degree in two to four years, depending on the credit-length and learning format of each program. Some PhD programs accept transfer credit, allowing students to transfer up to a third of their credits from other institutions. Before applying to a reading PhD program, take the time to think about your needs and learning style. Some online programs are self-paced and deliver classes asynchronously. This format generally allows online students to graduate more quickly. Other programs use a cohort format and may deliver classes synchronously, meaning that online students have to progress through the curriculum with their peers at a set pace. Additionally, some programs are fully online, while others are hybrid and include in-person requirements. Hybrid programs usually take longer to complete than entirely online programs, especially if they include on-site clinical or internship experiences. Students should consider regionally and nationally accredited schools. National accrediting agencies require schools to reapply for accreditation every three to five years to prove that they meet national standards for institutions of higher learning. Regional accreditation ensures schools meet a similar benchmark, although each of the regional accrediting agencies enforce slightly different standards. Common regional accrediting agencies include the Higher Learning Commission, the Middle States Commission on Higher Education, and the Southern Association of Colleges and Schools, Commission on Colleges. Both national and regional accreditation are important, but regional standards tend to be slightly more strict, and regionally accredited schools won't always accept coursework from nationally accredited schools. Nationally accredited schools typically accept any work from regionally accredited colleges or universities. Students can also look for programs accredited by agencies focusing on the fields of reading, literacy, or education. The Council for the Accreditation of Educator Preparation (CAEP) accredits teacher preparation programs, ensuring that schools provide graduates with the skills necessary to become future teachers. CAEP accreditation is a good benchmark to look for when choosing a literacy program. The U.S, Department of Education (ED) supervises the accreditation process by reviewing national and regional agencies. The ED holds agencies accountable to their own accrediting standards, maintaining the integrity of the accreditation process and education programs. For a complete list of accredited schools, be sure to check out the Department of Education's and the Council for Higher Education Accreditation's databases. Earning an advanced degree, like a literacy PhD/EdD, can help give you an edge in pursuing your dream job. A literacy doctorate prepares you for a variety of education jobs in diverse settings, making it easier to find your niche. According to a study from Georgetown University's Center on Education and the Workforce, education professionals who have earned an advanced graduate degree have an unemployment rate of less than 2%, while educators holding a bachelor's experience unemployment rates ranging from about 4% to 5.5%. Since doctors of literacy can pursue a variety of tracks, we look at the categories that best match literacy specialties and how unemployment rates differ for undergraduate and graduate degree holders. Graduates of reading and literacy programs are prepared for positions including high school teachers and college administrators. Annual wages fluctuate based on occupation and years of experience working in a specific field, so reading and literacy professionals can earn anywhere from $40,000 to over $100,000 annually. The table below looks at PayScale median wage data for teachers and school administrators based on the length of their careers. Reading doctorate programs prepare candidates for a variety of career paths. While the majority are education jobs, several different tracks are available. Leadership graduates can pursue administrative roles in secondary or postsecondary education, while graduates of teaching-centric programs can become high school teachers or college professors. Candidates who studied literacy issues for students with disabilities are prepared for special education roles, either as teachers or administrators. High school teachers craft lesson plans and teach subjects that prepare students for life after college. English and literature teachers teach language-based curriculums, helping students improve their ability to read advanced texts and interpret them in writing. In addition to instructing university students, postsecondary teachers conduct research, publish scholarly papers, and attend academic conferences. Postsecondary teachers usually work in universities or community colleges, and many spend time outside class advising students. While earning a master's degree might be enough for some postsecondary teaching roles, most teachers at the college level have a PhD. Principals supervise all daily activities in elementary, middle, or high schools. They manage teacher and support staff; ensure that curriculums meet district, state, or national standards; and cultivate a welcoming learning environment. Principals need at least a master's degree in education leadership or a related discipline. Postsecondary education administrators manage student services, academic coursework, and research activities at the collegiate level. Most postsecondary administrators focus on a specific aspect of the university, such as student life, admissions, or faculty research. Initially, administrators begin by working entry-level positions at a college, moving on to leadership roles once they earn a master's or PhD. Special education teachers instruct students who struggle with learning, mental, or physical disabilities. While they can teach a wide range of subjects, special education teachers often teach literacy skills at the preschool, elementary, middle, or high school levels. Special education professionals need at least a bachelor's degree to practice, but may need state certification or an advanced degree for some positions. While getting an advanced degree is important, researching and joining the appropriate professional organization can jumpstart your career search. Whether you're interested in working in international literacy, improving literacy rates among adults, or simply teaching middle school English, there are many professional organizations that connect educators through annual conferences, web seminars, and other resources. Professional organizations not only help you connect with potential employers, but can also support your later career in the form of professional development or financial grants. This association unites literacy educators, researchers, and professionals from over 80 countries with the goal of improving international literacy rates. The ILA sets professional standards, provides resources for educators, and even awards financial grants. This council aims to improve reading, English, and language arts instruction at all education levels. NCTE sponsors books, journals, and web seminars, such as the Literacy in Learning Exchange, to facilitate information sharing between English educators. Most PhD programs also offer funding opportunities to graduate students. While the specifics of PhD fellowships vary depending on the program, these grants often take the form of a teaching assistantship. In addition to providing tuition reimbursements or living stipends, a teaching fellowship provides the chance to teach undergraduate classes, a vital professional experience for any future educator. Read on for more information about possible funding opportunities for your online doctorate in literacy education.